MEGWARE and byteLAKE partner on HPC solutions. MEGWARE and byteLAKE are partnering to combine former’s extensive experience in the development and installation of high-performance computing (HPC) systems and Linux clusters with the latter’s huge experience in porting, developing and optimizing software applications for innovative, massively parallel supercomputing platforms. 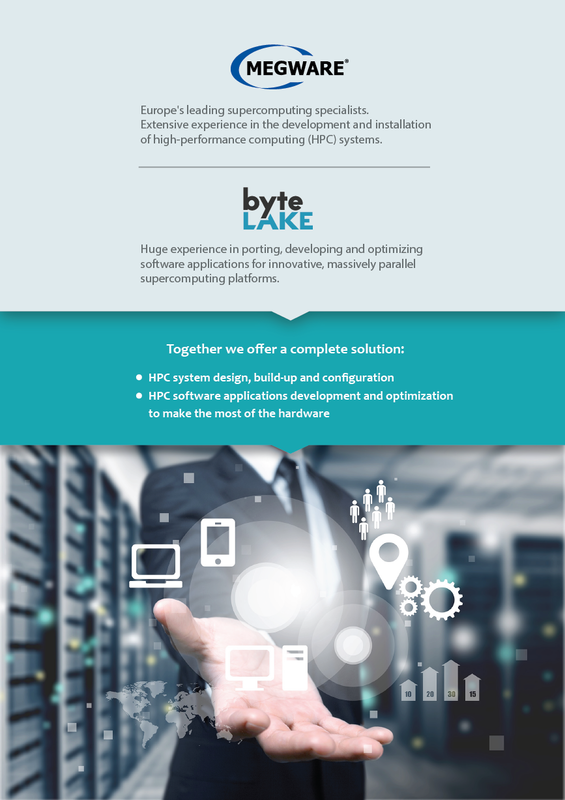 Running on MEGWARE’s HPC solutions, the customers will be able to benefit from byteLAKE’s expertise in designing and optimizing algorithms for high-performance, heterogeneous computing platforms. The partnership brings a new value to the market where industries gain access to a complete HPC solution: fully configured hardware and a highly optimized custom software application. “HPC is no longer a fancy keyword reserved for the most advanced research institutions. Its market hit record revenues in 2016 (HPC system sales reached $11.2B, Hyperion Research) and is expected to grow further. The trend is driven not only by advanced HPC simulations but also by high-end data analytics and Artificial Intelligence (AI) which propel HPC into new areas. At byteLAKE, we’re taking what we’ve learned from working with well recognized PhD level university researchers, doing pioneering work on advanced methods for parallel software design, and delivering that as solutions to our enterprise customers. Therefore, we are looking forward to collaborating on future deployments with MEGWARE, around the world, to deliver our customers complete HPC solutions with optimized applications, taking full advantage of the parallel nature of supercomputers.,” said Marcin Rojek, byteLAKE’s Co-Founder. “We are looking forward to establishing a close partnership with byteLAKE to provide extensive and professional HPC software services for customer needs.,” said Tobias Pfennig, Sales Director HPC at MEGWARE. The partnership has been officially announced during the Supercomputing Conference SC17 (http://sc17.supercomputing.org/, Nov 12-17 2017, Denver, USA, booth #1231 in the exhibitors’ area). byteLAKE are experts in porting, developing and optimizing software for supercomputer platforms (HPC). Our well recognized PhD researchers are doing pioneering work on advanced methods for parallel software design. While creating new methods for code and performance portability, and combining these with the best practices in the field, we help our clients develop efficient software across wide range of computational platforms. Besides, we specialize in adjacent areas like Machine and Deep Learning, helping enterprises embrace the power of Artificial Intelligence. MEGWARE’s road to success covers more than a quarter of a century of technological history. What began on February 1, 1990 with the production of computers in the garage of one of the company’s founders has grown into a pan-European company for high performance computing and IT solutions. Today, MEGWARE is one of Europe’s leading manufacturers of high performance computing and IT technology. As a full-service provider, we operate in the fields of consulting, development, sales and service, and have realized over 1100 HPC projects on behalf of companies, universities and research institutions.